At The Shop last week, local folk-rock sextet Folkinception is gathered around a stubby coffee table with mismatched seating. They chose not to meet at their usual South Perry District hangout, Lantern Tap House — the place started by guitarist Jeff Nordvall, where frontman Matt Mitchell met Nordvall, and where drummer Ben Bradley now works — because it would have been too distracting. Everyone knows them there. Still, throughout the interview here, just a block down the street, a couple of people come by to say "hello." An air of excitement fills their circle as the band easily jokes with one another. Their debut album Tower Mountain is about to be unleashed at the Bartlett and their new T-shirts (tan with a prominently featured chocolate-brown outline of Nordvall's old Dodge van, Moby) have arrived in the mail. There's much to look forward to, but there was a point when it wasn't certain the band would gel. "For a while we felt like hired guns," says Bradley of Folkinception's beginning two years ago. "It wasn't meant to be that way, but Matt already had these songs and he told us what we were supposed to be doing. When each of us started doing our own thing it became stranger and more interesting and more fluid; something we felt all connected to personally." Band members come from across the spectrum of the music world. 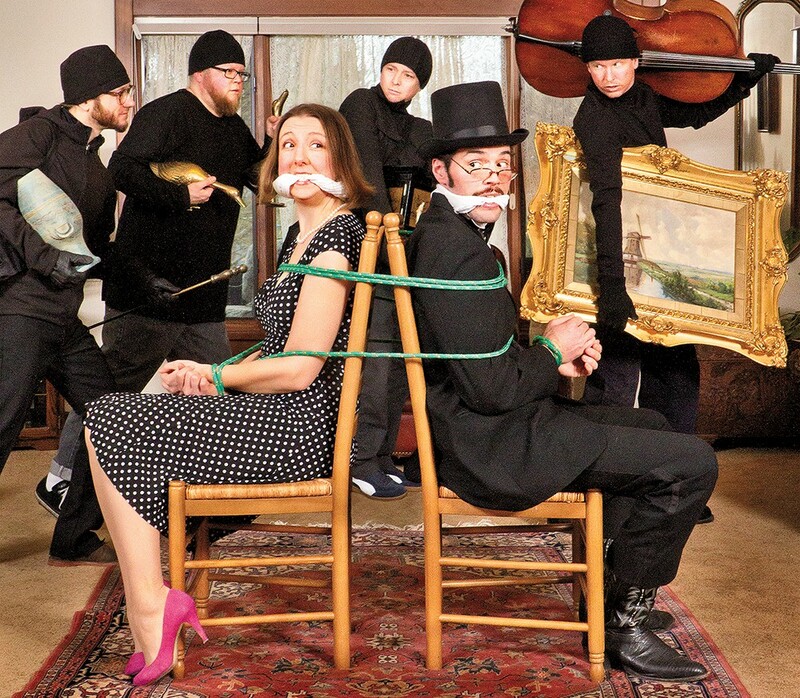 Violinist Heather Montgomery and cellist John Bottelli have classical music backgrounds, while Nordvall, Bradley and bassist Seth Carey came from a rock point of view. Singer/songwriter/multi-instrumentalist Mitchell brings the folk infusion. With the use of strings and mandolin, it's easy to peg the band as just another folk act before they even begin to play. But they're a whole lot more than that. "Listeners at our show would think 'Oh, it's this kind of band' after one song," Bottelli explains. "But then we'll play the next song and they'll think something different." Mitchell likens his band to Wilco, not because he thinks they sound like them, exactly, but because Folkinception brings a similar mix of rootsiness and rock to the table. "At the risk of sounding cheesy, I think honesty translates into good music," Mitchell says of his true-life lyrics. Last May, they decided they had enough material to get into a studio. In just over a month, with the help of Kickstarter, Folkinception raised $7,000 toward the project. "Kickstarter has a phone app that will push notifications every time someone donated. So every time I heard my phone buzz it was just the most satisfying thing," Mitchell recalls. It wasn't until August that recording began at Spokane Falls Community College. They chose audio engineer Steve Gamberoni, head of the Audio Technology program at SFCC, to produce. As Mitchell explains, they wanted someone who wasn't afraid to tell them when it wasn't sounding right; a real director. The effort proved more trying than they thought it would, not only because of the long hours — 79½ when it was all done in September — but because recording alone with a click track in your ear was a far cry from what the crew had been used to doing onstage. "During shows, we're playing off one another and looking at each others' faces and eyes and cues, and react to what's going on," Bottelli says. "You can't really do that in the studio. It required a big shift for us." In the middle of the process, Mitchell made the mistake of listening to the scratch track recordings. "I got super bummed out," he says. "I thought 'Oh my God, it sounds terrible.'" "But that's why they're called scratch tracks," Bradley adds. "They're not supposed to be good." Now they're finally satisfied with what they've accomplished. The mastering process did wonders for the album — taking it to a place the group is proud of. But the show is looming and they have to prepare. As they finish their last sips of beer and coffee, the group stands and stretches, ready to head over to their practice space just around the corner.